Lately, it feels like I have been saying a whole lot of goodbyes. I’m on the precipice of the most exciting adventure of my life, so why, at times, is my heart breaking? Why is saying goodbye so hard? Last week I said goodbye to one of my best friends, Kelly. I posted an Instagram about her the day she left… Yeah, I’m pretty high-tech like that. The post explained that Kelly was the friend I prayed for when I was a little girl. Though she didn’t come along until a few years into high school, when she did, we clicked. I assume it had something to do with our shared obsession for singing Broadway musicals, shamelessly, and at the top of our lungs. Kelly has literally changed my life. Side note: when I say literally, I literally mean it. As in the true meaning, not the 13-year-old girl meaning, who also insists she “literally died of laughter.” If so, someone needs to help her. She’s doing it wrong. You know the moment I knew Kelly was God’s answer to my prayer? The night she dragged me away from a party where I was getting a little, shall we say, ‘carried away.’ But she didn’t judge or criticise me. She drove me home and we stayed up until 2am dreaming about the lives we were called to lead. … And then all of a sudden, I was saying goodbye. She was off to change the world and I was left to wonder if I would ever see her again. I know it sounds selfish, and it probably is, but Kelly was my first real friend in school, and I didn’t want to give her up. But I knew it was time, so I said goodbye. Twenty-four hours after that goodbye, I had to say another goodbye to twenty-four years of living with my best friends, my heroes, my parents. This goodbye completely snuck up on me. It didn’t dawn on me that this was the last time we would live in the same country, at least for a few years, until we were approaching the airport. Suddenly, I realised what I was saying goodbye to… The smell of mum’s roast dinners in the oven. The opportunity to climb onto my daddy’s lap after a hard day. A spot on the Murphy judging panel as we watched the latest reality talent show. The late night chats and debriefs over a glass of wine. Home was wherever my parents were. I was saying goodbye to home. I tried to keep it together while I said goodbye, only letting a few tears slip through. 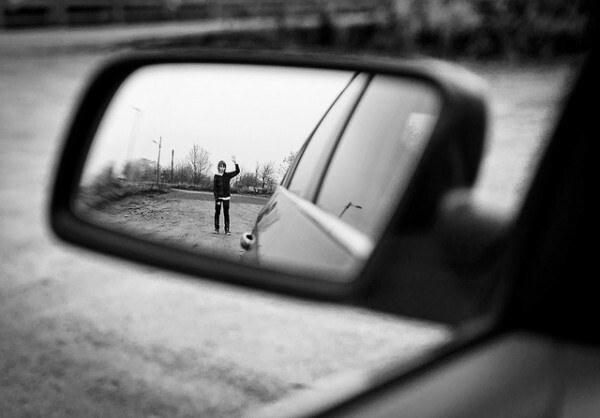 But, as I pulled away from the curb and looked back in my rear-view mirror, I saw my mum blow me one final kiss. That wasn’t fair. I lost it. There’s no other way I can describe that feeling except to say it physically hurt. That’swhy it was time to say goodbye. Maybe God was moving me away from my home so that I could find my true home. In Him. I think, sometimes, God has to remove the distractions in our lives, so we can clearly see Him. God is bringing an exciting hello into my life, and I suspect, on some level, into yours to. And yet, how will we see the hello if our focus is on the goodbye? But there is good news. I'm learning that God doesn’t ask for us to say goodbye, without giving us a hello in return. So, although it doesn’t ease all the pain, it does provide some hope. Hope that those tears aren’t in vain. Hope that the physical heartache will be overtaken by a fresh Spring-time. Hope that walking away from a comfortable life is making room for an adventure beyond our wildest dreams. Hope that our faith in God’s hello, will take us to a life we could never have thought, dreamed or imagined. Today, it’s time to shift focus. Are there things in your life you need to let go? Stereotypes of how life ‘should’ be? Disappointment? Shattered ideals? Relationships? Join me. There’s a new season waiting. It’s time to say hello.